World famous dance crew Jabbawockeez presents an audio-visual story of inspiration brought to life through the group's signature movements and sound. World famous Jabbawockeez continues to make their mark on the Las Vegas Strip with their show PRiSM at Luxor Las Vegas. Voted “Best Family Show” by IN VEGAS Magazine, PRiSM celebrates imagination and takes audiences on a journey of dance, music and inspiration. The show is a dynamic mix of jaw-dropping, in-your-face choreography, lasers, heavy-hitting music, and stunning special effects, forming a production that challenges audiences to embrace the unexpected. 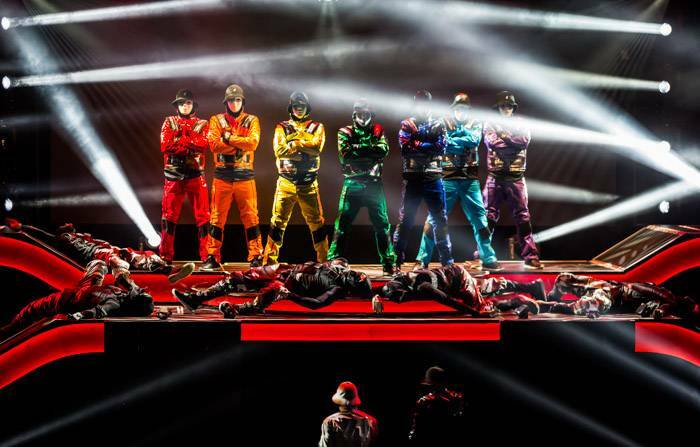 Wearing their iconic white masks and combining their unrivaled dance style using intricate synchronized dance routines, the Jabbawockeez provoke audiences to see music, hear color, and feel alive! Jabbawockeez has developed a one-of-a-kind style that has been incredibly influential in the dance community, effectively changing the way people view dance around the globe. Dressed in expressionless white masks and gloves, they guide the audience’s attention away from individual identities and toward a unified group to create a canvas for the audience to visualize the music by painting artistic imagery through their intricate moves. The Jabbawockeez, an all male, hip-hop dance crew was established in 2003 in San Diego, California. The name Jabbawockeez was inspired by the fantastical monster from the Lewis Carroll nonsense poem “Jabberwocky”. White masks and gloves were adopted as the visual signature of the group. In 2007, the JabbaWockeez appeared on the second season of America's Got Talent. Performing with nine members, the group was eliminated in the Las Vegas callbacks episode. In 2008, they auditioned and were accepted onto the first season of America's Best Dance Crew, winning the competition. In the 2008 AXA (Asian Excellence Awards), the JabbaWockeez were voted as the Favorite Reality TV Star, where they also performed with Kaba Modern on stage. In 2012, they were the first dance crew to be awarded the Living Legend of Hip Hop Award from Hip Hop International. They were also the recipients of a Lifetime Achievement Award from the Set It Off Competition 2013. In 2010 the Jabbawockeez debuted their own live stage show called MÜS.I.C at the MGM Grand Hollywood Theater in Las Vegas. They are the first dance crew to headline a show in Las Vegas. In May 2013, they moved to the Luxor Hotel for their revamped show PRiSM, housed in a brand new 850-seat theater. A mural of the crew is painted in the lobby by performance artist David Garibaldi. Tickets are available at www.luxor.com. A: Must be 5 years of age or older. Q: Where can I buy show merchandise? A: Located in the heart of the Luxor Hotel and Casino, the Wockshop is the only retail location worldwide selling authentic Jabbawockeez gear. You may find exclusive gear not sold anywhere else but in the Wockshop! For special circumstances and requests please call our box office at 702-262-4400. Accessible seats, assistive listening system and sign language interpreters are available in the Luxor Theater.